How fast do you think you are? Do you know what a reflex and a reaction are? This lesson plan tells all about the quickness of your nervous system and the muscular system, which the nervous system innervates. In this experiment you are going to be introduced to what a reflex and reaction are and how we go about measuring them. Do not worry we won't be throwing soccer balls at your face. . . yet! Note: Backyard Brains has released a digital reaction timer that uses your body's electrical signals to measure your reaction time! If you enjoy this experiment and want to take it to the next level, check out the Backyard Brains Reaction Timer! The speed of your reactions play a large part in your everyday life. Fast reaction times can produce big rewards, for example, like saving a blistering soccer ball from entering the goal. Slow reaction times may come with consequences. Reaction time is a measure of the quickness an organism responds to some sort of stimulus. You also have "reflexes" too. Reflexes and reactions, while seeming similar, are quite different. Reflexes are involuntary, used to protect the body, and are faster than a reaction. Reflexes are usually a negative feedback loop and act to help return the body to its normal functioning stability, or homeostasis. The classic example of a reflex is one you have seen at your doctor's office: the patellar reflex. This reflex is called a stretch reflex and is initiated by tapping the tendon below the patella, or kneecap. It was first independently described in 1875 by two German neurologists, Wilhelm Heinrich Erb and Carl Friedrich Otto Westphal. In their original papers Erb referred to the reflex as the "Patellarsehnenreflex" while Westphal denoted it as the "Unterschenkelphanomen". Thankfully, we now refer to it as the patellar reflex. A sensory component or afferent neuron. These neurons take in information and translate it to an electrical signal that gets sent to the central nervous system, much like the spikes you hear when doing the cockroach leg experiments. Integrating center or interneuron. 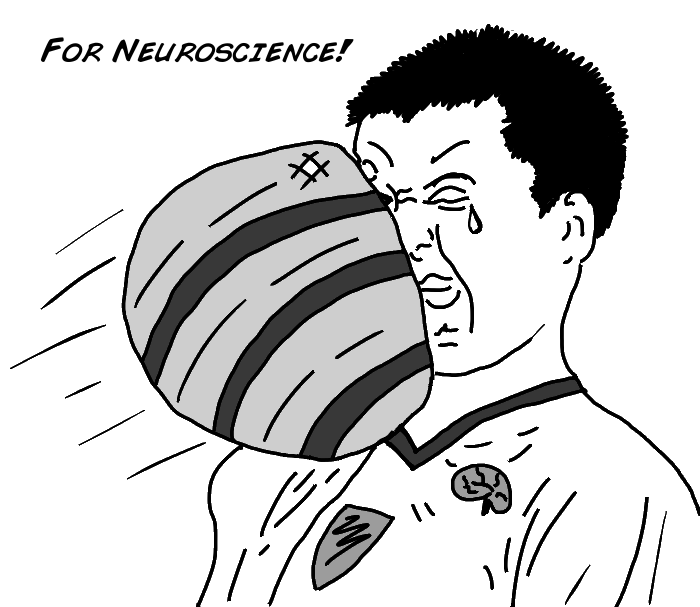 These neurons act as sensory processing centers that determine the magnitude of the response to the incoming stimulus. They are located in the central nervous system (your spinal cord). The efferent portion or motor neuron takes the information from the interneuron and sends it to the effectors which activate a response. The effectors are usually muscle fibers as in the patellar reflex or a gland such as the salivary gland. More Neuroscience in your Inbox! If you're excited about Neuroscience, sign up to get monthly newsletters about new experiments, events, workshops, and kits! 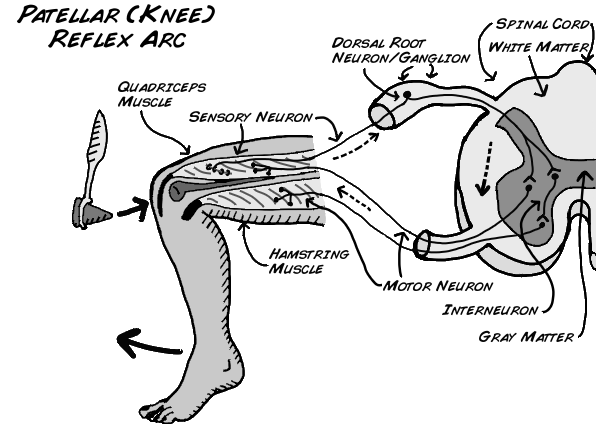 The knee reflex arc is a spinal reflex, and the circuit is drawn above. This picture shows how the sensory (afferent) neuron sends information through the dorsal root ganglion into the spinal cord; where the signal splits into two different paths. The first is the motor neuron (efferent) leading back to the quadriceps. When your quad muscle's motor neuron receives the information it fires and causes your lower leg to spring forward up in the air. The second signal from the sensory neuron travels to an interneuron which sends a signal to the motor neuron (efferent) leading to the hamstring. This signal tells your hamstring to relax so there is no negative force acting on the quadriceps muscle when it contracts. Both signals work together and all of this happens in the spinal cord without going to the brain. It never needs the brain. You may be asking how a knee reflex arc and a soccer player dealing with an oncoming ball are different. Are both not reflexes? While it may seem that a soccer player negotiating an oncoming ball is a simple fast reflex, it is actually a symphony of hundreds of thousands of neurons working together to produce a conscious decision. Does the player catch, dodge, or bat away the ball? This choice is what makes a reaction. 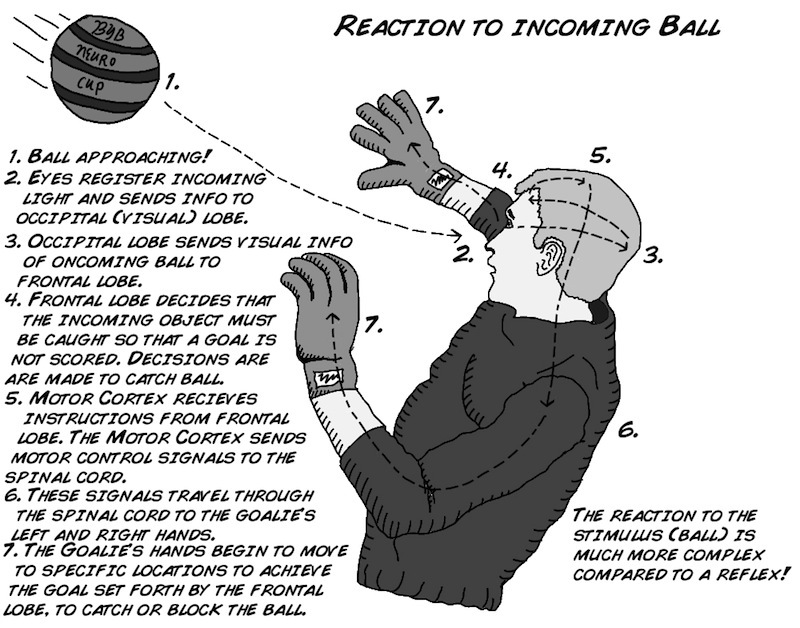 When a soccer player realizes the ball is blistering towards him, there is visual information that has to be processed and decisions regarding a correct course of action. The brain then needs to send many signals to various muscles. Feet begin to move, hands might travel in front of the face, and eyes may close shut, along with many more processes. This is the work of many neurons as well as numerous systems and circuits in the brain, and what's more, and you can train and enhance your skill through practice. This is how you get better at sports over time. Like all science, the history of the reaction time discovery is peculiar. Dutch physiologist F.C. Donders in 1865 began to think about human reaction time and if it was measurable. Prior to his studies scientists thought that human mental processes were too fast to be measured. This assumption was proved incorrect with the help of Charles Wheatstone, an English scientist and inventor. In 1840 Wheatstone invented a device, much like his early telegraph system invention, that recorded the velocity of artillery shells. Donders used that device to measure the time it took from when a shock occurred on a patient's foot until when that patient pressed a button. The button had to be pressed by the left or right hand matching the left or right foot that was shocked. His study tested 2 conditions: in the first, the patient knew in advance which foot was to be shocked; in the other condition, the patient did not know. Donders discovered a 1/15 second delay between patients who knew which foot was to be shocked versus patients that did not know. 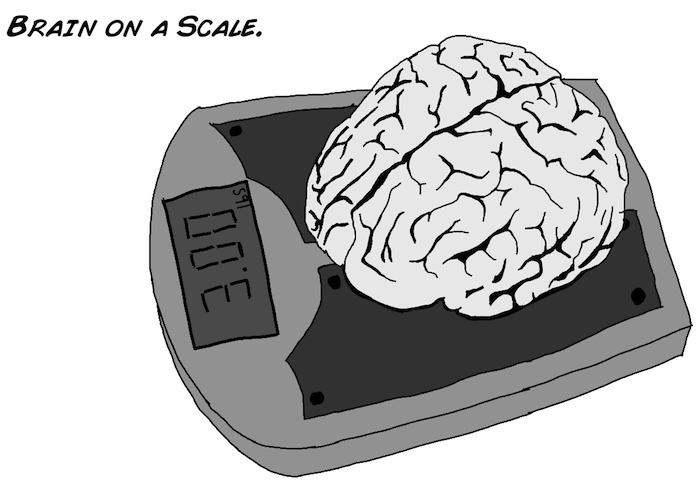 Notably, this was the first account of the human mind being measured! 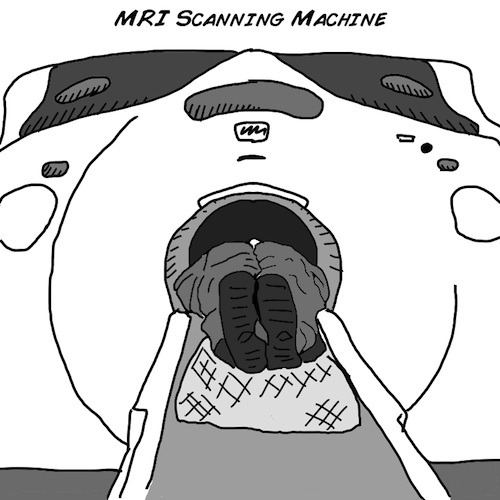 These efforts continue today, with the improvement of "non-invasive" imaging technologies like fMRI, PET, EEG, etc... You may have had one of these scans in the hospital. How quickly neurons move information is called the "speed of neural transmission"; we studied it in experiment 11 when we measured the conduction speed of axons in earthworms. This is only one of the speed bottlenecks though. You also have to deal with the synapse (which we studied in experiment 8). Furthermore, the quickness of reaction times can differ depending upon what type of stimulus you are reacting to and what kind of task you are doing. In this experiment you and a friend will be testing each other's reaction times using a simple 12 inch ruler. You will be testing not only visual stimulus, but also auditory and tactile stimuli. This experiment will be broken into two phases. The first test will use one ruler, while the second test will use two. 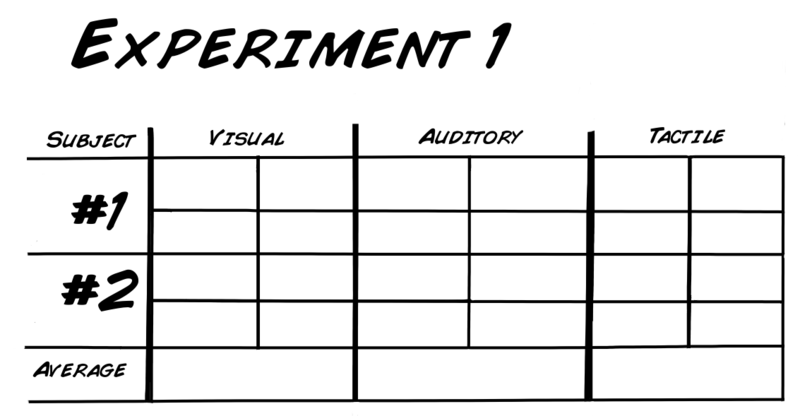 Experiment 1: In this phase you and your partner will test visual, auditory, and tactile reaction times using one ruler. Have your friend sit at a table with their dominant hand over the edge. First we will test visual response. 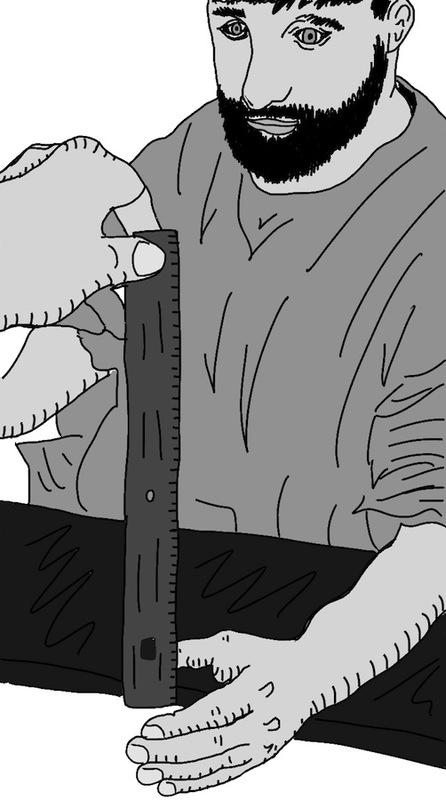 Hold the ruler at the 30 cm mark so that the 0 cm end is just at your friend's index finger. Tell your friend that when you release the ruler they are to grab it as fast as possible. Do not make any sounds or gestures that you are releasing the ruler. They have to react to the visual stimulus of seeing the ruler being released. Record the centimeter mark. Repeat the experiment three more times. Then switch places with your partner and redo it. Now you will record auditory reactions. Have your partner sit at the table as before, also be sure your partner puts on the eye shades. Again testing the dominant hand, tell your partner that you will say the word "Release" as you release the ruler. Once they grab it record the centimeter mark and repeat 3 times. Switch places with your partner again. For the last test, have your partner sit at the table wearing the eye shades again. This time you will test the tactile response. Tell your partner that you will touch the shoulder of their non dominant arm as you release the ruler. Give you partner no auditory cue that you are releasing, just a simple touch. Record the measurement and like before, repeat three times, then switch places and redo. Experiment 2: In this phase you and your partner will test visual and auditory reaction times using two rulers. For the Visual portion of this experiment have your partner sit as the table, like before, but have both of their hands over the edge. You will hold both rulers this time instead of just one. Tell your partner that you will release just one ruler and they must pick the correct one and grab it as fast as possibleâ€¦Tell them they must not squeeze both hands, only one. When you are ready to begin, randomly decide one ruler to drop. It does not matter which one, you will perform this test 3 more times, but never tell your partner which ruler you will drop. Again as before switch roles and redo. Finally, we will test the auditory reaction again. This time using both rulers. Get in the same position as before with both rulers. Make sure your partner has the eye shades on. You will then proceed to say "left" or "right". As you say it you will drop the corresponding left or right ruler. Your partner must decide which ruler to grasp based on the auditory cue you give: "left" or "right". As before, your partner must only squeeze one hand. Record the measurement and repeat 3 more times, remember to randomly decide which ruler to drop. Switch roles and repeat. In your chart above you are going to take all the centimeter measurements you have collected and convert the measurement in centimeters to seconds. This will tell you how long it takes, in seconds, an object (the ruler) to fall a certain distance. 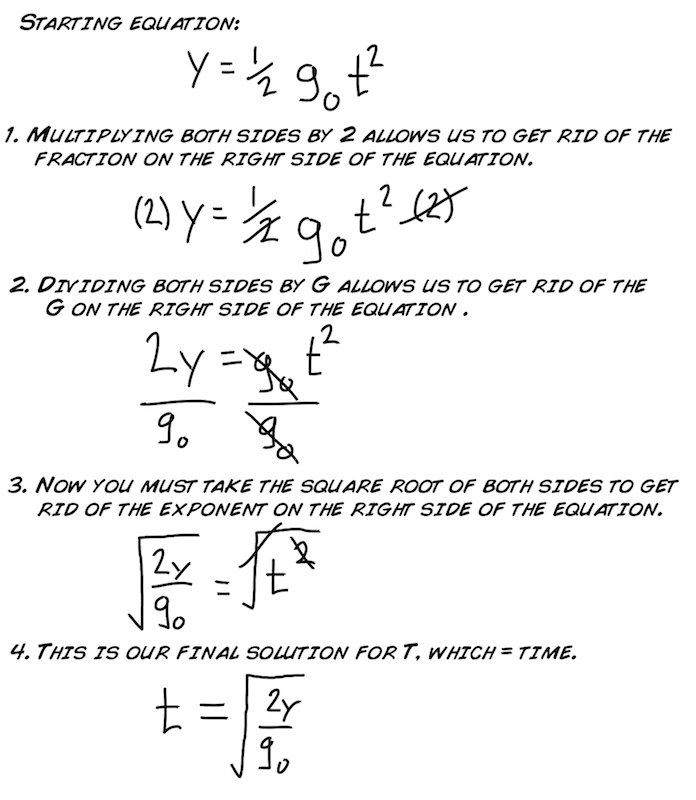 The formula below is comprised of three variables. 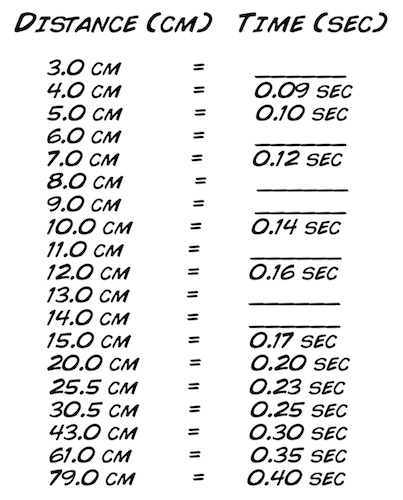 It may seem tedious to convert by hand each number you recorded so instead you will be provided with a quick chart to convert your centimeter measurement to seconds. However, there are several values missing in the table. You will need to fill them out to complete the table. 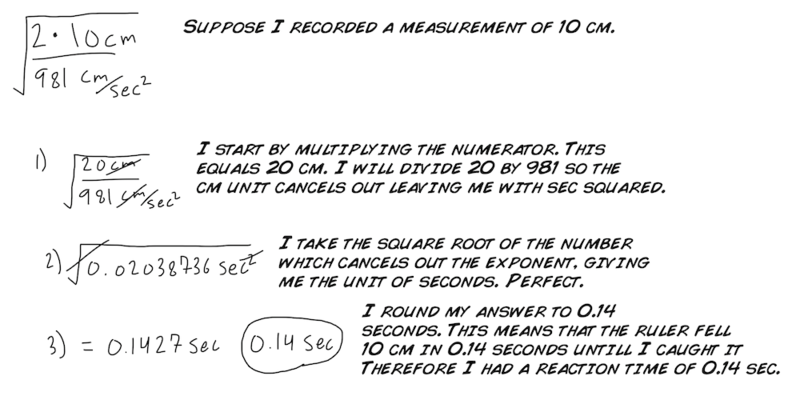 Use the equation above to fill out the remainder of the chart. If you are savvy you can also design a computer program to do this. After using the chart and converting your centimeter measurements into seconds you will have your ruler reaction time in seconds. Looking at your data you might be thinking how you compare to the human average reaction time. Here it is! The average reaction time for humans is 0.25 seconds to a visual stimulus, 0.17 for an audio stimulus, and 0.15 seconds for a touch stimulus. This handout was designed by Virginia Johnson, a graduate student who adapted our experiment here to use as a teaching tool. 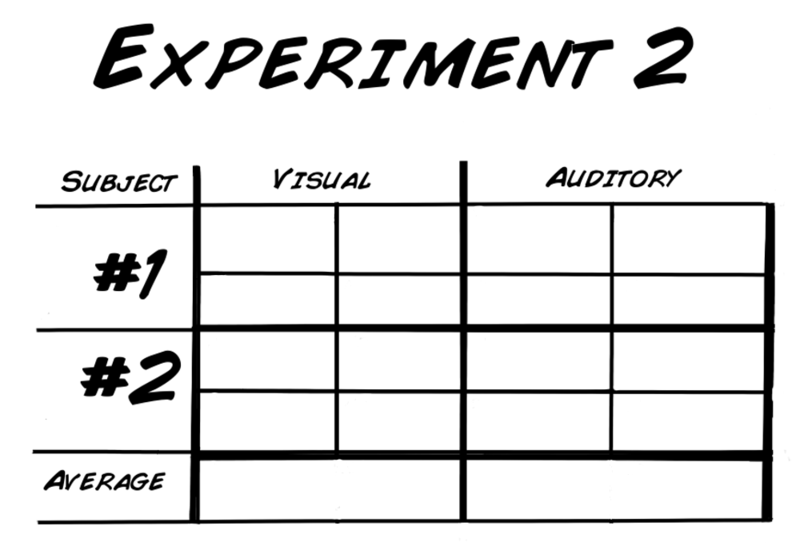 This handout provides great instruction for the visual, tacticle, and audible experiments performed here condensed down into one page! Thanks Virginia for Sharing it with us! Why do you think touch and audio stimuli have a faster reaction time on average? How much faster is it? Do your results match the averages mentioned above? Why not test the "tactile" reaction time in the choice task? How could you redesign the experimental setup to test tactile reaction times in the choice task? As you know, you have a dominant vs. a non-dominant hand. With only four trials, it is too hard to see a difference. Perhaps you should repeat the experiment 10-20 times and with right and left dominant people to see if there is any difference between dominant and non-dominant hands. The average conduction velocity speed is approximately 20-80 m/s. It takes approximately 1 ms for a neurotransmitter to cross the synapses. Calculate the lower limit for your patella reflex vs. what you imagine for the patellar reflex of a giraffe. As a test, see if you can find a difference in reaction speed of people of differing heights.